The sky map shows a "beneath the dome" view of the sky with the central point representing the zenith, (straight up). The map has some interesting features, including stars with selectable limiting magnitude down to magnitude 5, the time marked paths of Jupiter and/or the Sun, and antenna coverage patterns. The map makes it easier to determine which antenna configuration is best for a particular time. Each item can be selectively displayed including the grid. The mag button brings up an input box in which you can select the limiting magnitude for the stars. (See if you can pick out the constellations.) You may also display the plane of the Milky Way on the map by selecting the Galactic Plane check box. This is important because along the galactic plane and especially near galactic longitude 0, you can expect higher background radio noise levels. The Grid can be turned off and on. You can ascertain any position on the chart simply by moving the mouse over it and watching the title bar of the window. The green ellipse represents the 3 dB points in the antenna pattern. Inside of the ellipses is thus within 3dB of the strongest signal available from the antenna. 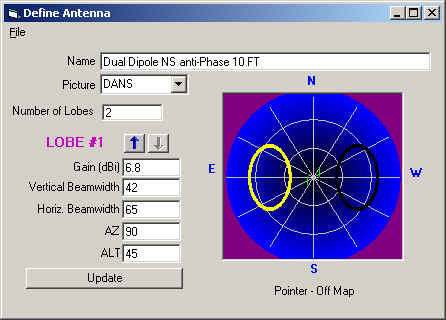 A central mark + and numerical designation (8.44 dBi in the example above) shows the beam center and the strength of the antenna beam at that point when compared to a hypothetical antenna that would radiate in all directions. The green bars near the center represent the orientation of the dipoles. The antenna files are text files and could be edited manually but a tool is provided to make working with them easy. You may define new antennas or modify the existing antenna pattern information by using the Define Antenna Tool. Press the Define Ant button from the Sky Map to get there. Give the antenna a descriptive Name. There are a few antenna element arrangement "pictures" to chose from. If one exists for your antenna (dipoles and dual dipoles presently) then select one. Enter the number of lobes you wish to define. You must have at least one. If known, enter the gain in dBi (decibels over an isotropic antenna) for the lobe. Enter 0 if unknown. Enter the Vertical and Horizontal beamwidths of the antenna lobe in degrees. Apply AZ (Azimuth) and ALT (Altitude or Elevation) coordinates for the lobe. If you need to define additional lobes, do so using the arrows to move between lobe definitions. Be sure to press Update each time. Press File/ Save Antenna to save your creation. use the ANT file extension and save the file where you are keeping you other antenna definitions. Lines that begin with # are ignored. Begin at 0 degrees azimuth (North) and supply on each line a azimuth value followed by a space and an elevation value that corresponds to the horizon. Areas between defined azimuth points are interpolated so you do not have to supply every degree of azimuth. If you own Radio Eyes, you will find it has a tool to help you graphically create horizon files. 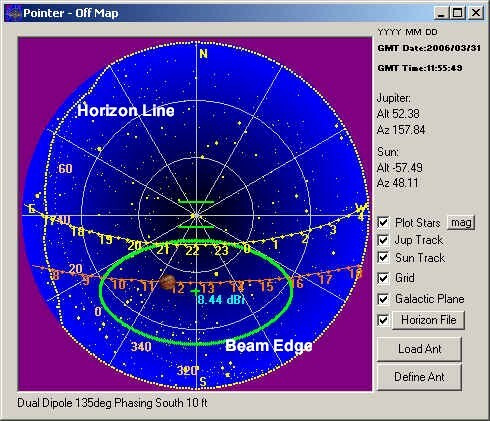 You can point Radio Jupiter to the Radio Eyes horizon file if you wish.